Quick Christian Feminism Quiz: What do you think of this image? Artist Edwina Sandys created a sculpture of a female form, arms outstretched as if hanging from a cross. The sculpture, entitled Christa, has created controversy wherever she is displayed. Critics say the statue defies the historical fact that Jesus was a man. 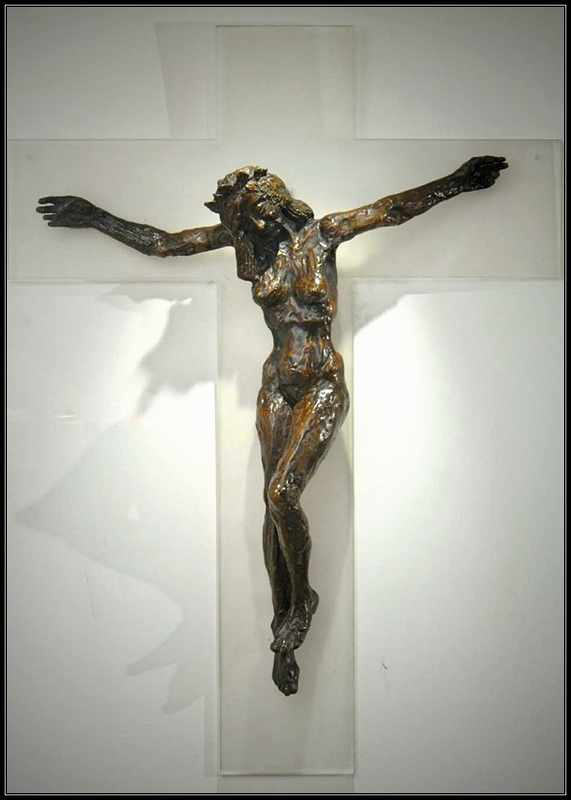 Some viewers feel that the symbol of the cross is degraded or even blasphemed by a Christ in female form. Others are disturbed by the sexual overtones of the naked woman. Some people are troubled by yet another violent image of female suffering. A few people see in the sculpture the message that the death of Jesus symbolizes the pain of all human suffering. The response to [this image] reveals various theological assumptions. Some people dismiss…the sculpture because they are literally false. Jesus was a man. End of discussion. Other people consider these images offensive and uncomfortable. It insults Jesus, and them as well, to think of him as a woman. These imaginative reconstructions of important events in the life of Jesus pose an important theological question: What difference does it make that Jesus was male? Have at it. What do YOU think about this piece? What’s your first gut reaction? Why? What difference does it make that Jesus was male? What must it do to the psychology and religious and spiritual experience of women that their entire life in Christianity is being told to obey, model, worship, and adore a man in order to experience all it promises? Now to be clear, no feminist that I’ve ever read brings up this topic in order to challenge the historical fact that Jesus was a male. That’s not the issue here. Providentially, that is how God did it, and there were perfectly good historical and cultural reasons for doing so. The issue here is that there were a lot particularities about Jesus. He was Jewish, lived in a particular geographic area, was a construction worker, spoke a certain language, had a certain skin color, wore certain clothes, etc. And yet which of these particularities do we choose to invest with special meaning? And this isn’t theoretical. In the 1970s, during the Vatican II reforms of Catholicism, they brought this up as a primary reason why they wouldn’t let women be priests. Priests had to have a “physical resemblance” to Christ. And yet this “resemblance” wasn’t in dress, language, ethnicity, and or race–but in maleness. Others might say that the Bible predominantly speaks of God in masculine terms, therefore of course Jesus would be male. But is the subtle assumption there that maleness more accurately represents God in some way? Would a woman have been “insufficient” to be the incarnate God? The early church articulated beautifully the idea that whatever Jesus did not take on, he did not redeem. If it’s important not simply that Jesus was human, but specifically that he was male, then in what sense did Jesus “take on” female nature? Are women redeemed as well? Of course that is silly, but to people to think that maleness was absolutely essential to the Incarnation, it’s logical. These are the questions at hand. We have little problem with accepting art that depicts Jesus in ways that go against what we know about him. Some of the most well-known and honored depictions of Christ have him looking white, European, dressed in the clothing of other eras, crucified alone and not with the thieves, with other characters and individuals around the Cross, etc. Jesus has been brought into the experience and culture of different peoples since his death and Resurrection. And yet these images don’t punch us in the gut like seeing him as a woman. Why? What makes his maleness so much more sacred than every other historical, biblical, and cultural particularity he took on? This post is part of our Lent series on Women in the Church. I’ll admit, my gut reaction was that it was sacrilegious for depicting Jesus as something he wasn’t, but then I realized, as you also mentioned, Jesus is virtually always depicted as white when he almost certainly wasn’t so this is hardly different. After going through that thought process, it seems like this artistic license may help women to better identify with Christ and His suffering so, as long as no one is trying to claim Jesus was a woman, I don’t see an issue with it. Why do we want to change the scripture which is the Word of God? Satan would advise us to tolerate but toleration means acknowledging it even though it is wrong. MAY GOD SPEAK TO THE ARTIST AND NOT TO CAUSE CONFUSION!